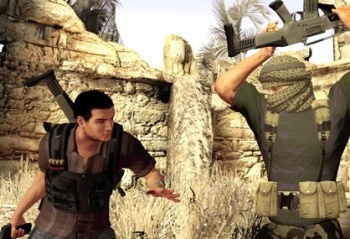 With Obsidian's new RPG Alpha Protocol less than a month away, Sega has laid out the details about the game's DRM, which will require a one-time online activation but also offers an option for gamers who aren't on the internet. Digital rights management is a fact of life for PC gamers, more often than not one they'd rather not have to put up with. Alpha Protocol publisher Sega seems to have recognized the truth in that, and is doing its best to get the word out about the game's DRM, how it works and why it's not nearly as bad as some of the stuff out there. Alpha Protocol will use the Uniloc: SoftAnchor system and require a one-time online activation. Activation keys included with each copy of the game will be good for up to five unique systems, allowing users to play on their home PC, their laptop, at work and so forth, and activations can be deactivated for reuse in the future. Acknowledging that the Uniloc servers won't be around forever, Sega has also promised to release an "unprotected patch" for the game in the future which will remove all DRM and activation requirements. If that sounds familiar, it's because companies like EA and Take-Two already use one-time, limited-use online activation systems. But what about gamers who aren't online, or who are stuck with rough, unreliable internet connections? Sega's got that covered, too. Gamers without internet access at home will still be able to activate via a "Web Based Activation" system, by saving a specific file to disc or flash drive, then taking it to a computer that does have net access and uploading it to an activation website. The site will then provide a different file which must be downloaded and transferred to the unconnected machine, after which the game installation will proceed normally. It may not be a perfect solution, but it's a much better approach than that taken my most other publishers, which is to say that if you don't have internet access, you're screwed. Sega gets points, too, for getting out in front of the inevitable controversy by posting a detailed DRM FAQ and just about begging users to ask questions if they have any. Copy protection will never be anybody's favorite thing but if more publishers begin to take this kind of approach, it might at least not rankle quite as much.